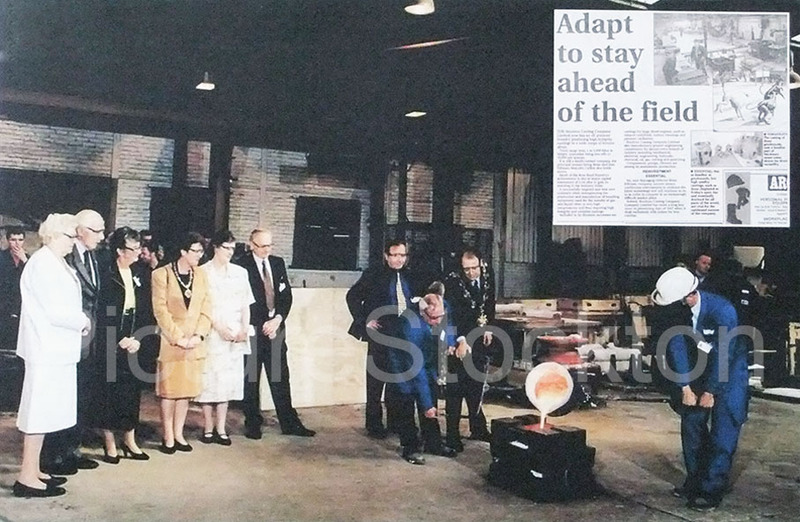 This picture of a 50th Anniversary Celebration at Stockton Castings was taken from a booklet commemorating the history of foundries on Teesside. There is an even earlier set of pictures from 1947. I was loaned a copy by Mr Alex Fleming of the company, following a visit by members of the Newcomen Society for the Study of Industrial History and Engineering, on 17th July 2018. So Stockton Castings have now been going for over 70 years. Our members were very impressed by the way the foundry is now laid out, to ease manhandling and ensure that the castings are of the highest integrity. There was a Norman Kidd in our class at Richard Hind 1953-59. Are you the same? Look up Fred Kidd and Son Engineers and Brass Founders Church Row Stockton-on-Tees. Fred Kidd resurrected Rogers and Sons when they went to the wall in the 1920’s. Fred built a new Machine shop and foundry which operated till they too went out of business in about mid sixties. Thank you for your picture of the Stockton foundry, part of your histories of foundries on Teesside. I have the history of the Davy United roll foundry both in text and photographs if they are of any interest to you. Regards , Jim.